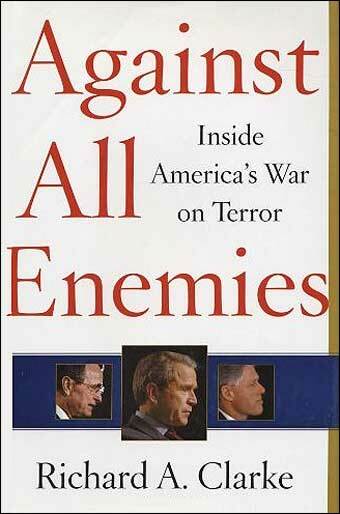 Against All Enemies: Inside America's War on Terror /by Richard A. Clarke. Examines America's war on terror, both before and after September 11th, including what went right or wrong, the operations of al Qaeda, the Department of Homeland Security, and other crucial actions of the Bush administration. from the first thrilling chapter, which takes readers into the White House center of operations on September 11, through his final negative assessment of George W. Bush’s post-9/11 war on terror, Clarke, the U.S.’s former terrorism czar, offers a complex and illuminating look into the successes and failures of the nation’s security apparatus. He offers charged (and, one must note, for himself triumphant) insider scenes, such as when he scared the devil out of Clinton’s Cabinet to motivate them to fight terrorism. The media has understandably focused on Clarke’s charge that Bush neglected terrorism before the attacks on New York and Washington; but Clarke also offers a longer perspective on the issue, going back to the first Gulf War (when he was an assistant secretary of state) and makes some stunning revelations.